Vienna Acoustics WALTZ GRAND. Central Speaker. With an ultra-thin profile whose thickness fits perfectly with that of flat-panel televisions of the latest generation, the Waltz Grand is the perfect speaker to complete with the biggest success of audiovisual systems of high aesthetic value in which the sound quality is a requirement non-negotiable. For this to be possible, Vienna Acoustics has equipped it with an electro-acoustic configuration that has nothing to envy to the other models of the Grand series: two 153 mm (6 ") midwoofers with transparent cone of X3P mounted in suspension Acoustics (hermetic enclosure), silk dome tweeter with special coating and frequency divider filter executed with audiophile grade components. A device to facilitate wall mounting makes the Waltz Grand a sound box ideal for completing the most imaginative and committed multichannel audio installation without at any time meeting the aesthetic requirements and demands of sound quality. 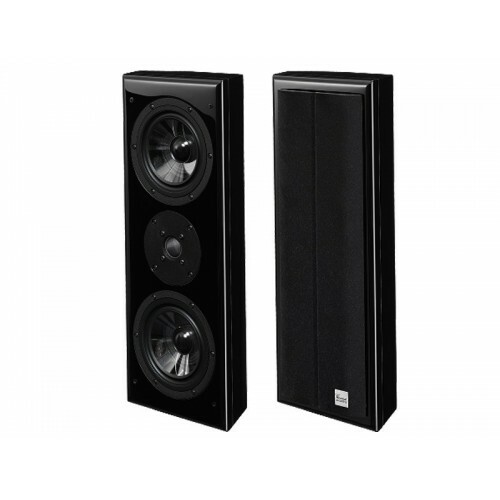 Monitor: 2 way / 3 speakers with airtight enclosure for surround sound effects. Sensitivity: 91 dB / W / m.
Amplification power: between 25 and 180 W continuous. Dimensions: 200x480x95 mm (W x H x D).